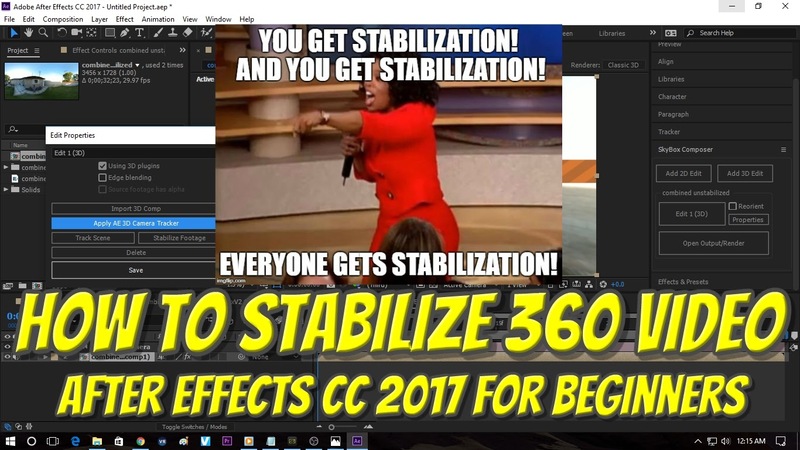 Here is a tutorial for beginners for stabilizing 360 videos using After Effects CC 2017. No prior experience required! In June 2017, Adobe acquired Mettle. Among other things, Adobe added Skybox Studio to Creative Cloud. If you haven’t downloaded Skybox Studio yet, you can download it here. 1. Download Mettle Skybox Studio (now included with Adobe Creative Cloud subscription). 2. Launch After Effects. Under File menu, import your video. Part 1: Creating the tracking information. 6. On Skybox Composer, click on Properties and then “add 3D Camera Tracker.” Wait for After Effects to analyze the video. 7. On the left side of the screen, click on the Effects Controls. If the Effects Controls don’t show up, go to Window menu, workspace… then Effects. Click on Create Camera. Part 2: Stabilizing the video. 8. On Skybox Composer, click on Properties, and make sure the dropdown box is for the video you’re working on. Click on Stabilize. 9. To render the video, go to Skybox and click on Open Render. On the File menu, click on Export… then Add to Adobe Media Encoder, which will launch automatically. 10. In Adobe Media Encoder, click on the file name and location to change it to your preferred name and location. To begin rendering, click on the green play button. That’s all there is to it! I hope you found the video helpful. Please hit the thumbs up on my Youtube video!